Here at Wavestream, we understand that innovation is the creation of value by solving real world problems. We are trusted by our customers to deliver best value solutions. This is our focus and our drive, the creation of value for you, not as a customer but as a partner. With over a decade of experience in the satellite communication industry, Wavestream’s unbounded creativity allows us to turn your unique programmatic needs into solutions that fuel your business growth. We design quality into every product by leveraging our AS9100 certified Quality Management System in conjunction with our airborne based product development process which is used for all Wavestream product development initiatives whether standard off-the-shelf, semi-custom or fully custom to meet your specific product needs. With this process, Wavestream engineering performs design verification and qualification testing against the industries toughest commercial and military standards to ensure we deliver the highest industry reliability for airborne and ground systems products designed for operation in the world’s harshest and hostile environments. As a partner, Wavestream understand the value of a good investment so there are no corners cut when it comes to managing your investment with Wavestream. We leverage our seasoned program management team who interface directly with our integrated project team resources and you, our valued customer, to ensure your programmatic needs are met. Innovation does not stop with the design of a product but continues on into the manufacturing process to ensure a great design that can be manufactured at volumes to meet our customer’s largest programmatic needs. At Wavestream this translates to strategic alignment with our supply chain and tough quality restrictions to ensure only the highest standards of quality materials make their way into our products. 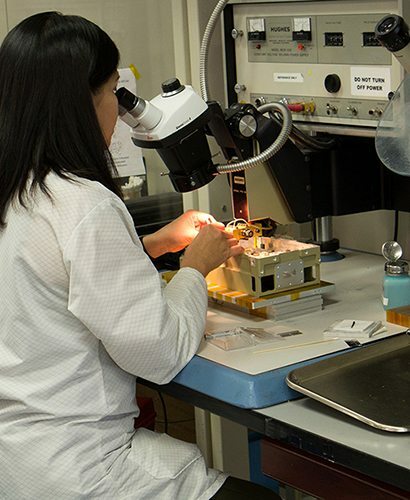 We design and manufacture Radio Frequency (RF) amplifiers that use solid-state sources to produce high to very-high power at microwave and millimeter-wave frequencies. Our patented Spatial advantEdge™ technology allows us to create more compact product packages that provide higher power, greater reliability and improved efficiency for any mission-critical application. The spatially power combined amplifier employs a different technique for combining the transistor outputs than traditional MMIC-based amplifiers. Rather than combining in multiple steps, increasing loss and size with each combining stage, all transistor outputs are combined in a single step. Many amplifying elements synchronously amplify the input signal, and their outputs are combined in free space for very high combining efficiency. For more information on the Spatial Power Advantage, please contact us at sales@wavestream.com.